At least the Financial Times of London wine writer Jancis Robinson has not fallen for that different glass for every wine type nonsense. Asked by London-based product designer Richard Brendon if she would be interested in designing a collection together, Ms Robinson said she wanted to create a single glass, not a series. 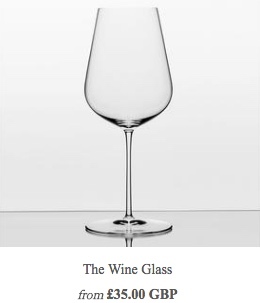 The 1 Wine Glass is made by hand, according to the Fast Company website, with a very fine lip so there’s as little glass as possible between the wine and your tongue. They’re designed so that a standard glass of wine (five fluid ounces) sits right at the widest part of the glass to maximize surface area, which enables the wine to release more of its aroma. Personally, the Owl is not in the business of paying $62 or so on a single glass. The ISO standard glass seems to do the job just fine, thanks, at a dozen for that kind of price.